Lately on social media, Evander Kane of the Winnipeg Jets has been tagging tweets with "Ray Charles To The [Expletive]," a line from "She Will" by Lil Wayne and Drake; with messages like "to all the great Fans [that] don't hate I appreciate." Kane, currently out of the lineup with a concussion, is leading the Jets in goal scoring this season. But his relationship with some fans and the media has had its challenges — like recently scuttlebutt about his dining (and dashing) habits. This sign, about Kane skipping out on bills, made its way around social media before Kane himself dismissed it on Saturday. But that acknowledgement launched a slew of gossip about Kane that Gary Lawless, a columnist for the Winnipeg Free Press, called "disgusting" as his newspaper had to shut down its comments section on Saturday night. What's happening with the relationship between fans, media and the Jets' brightest young star? 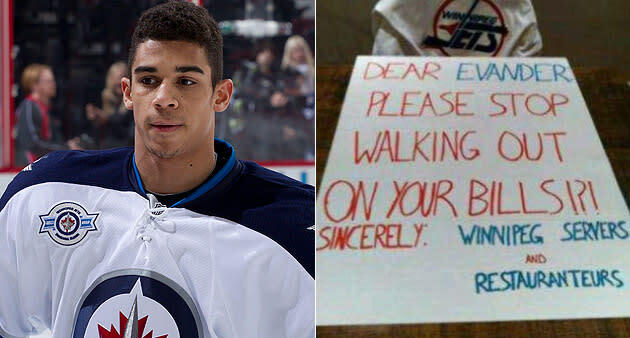 The offending sign first appeared at a Jets game in Ottawa last week: "Dear Evander: Please stop walking out on your bills. Sincerely, Winnipeg servers and restauranteurs." Kane posted the picture on his Twitter account with the message, "Ha, Ha. What a complete lie this is but I really like the colours on the poster." The Jets were refusing comment on Saturday, but in making calls to Winnipeg restaurants I was able to learn that NHL security had conducted an investigation into the matter. A Jets executive confirmed this and stated the investigation came up empty. The folks in the restaurant business that I spoke with had good things to say about Kane. Jets Nation's Scott Taylor, who's covered hockey in Winnipeg since 1976, covered the sign controversy and added some additional gossip about Kane being involved in an altercation "at a Winnipeg bar called Whiskey Dix," with his concussion admission somehow tied to that altercation. He also noted that Kane has ended up on TheDirty.com, "a social stigma website that pays tribute to those who act like douchenozzles in public places." A local Winnipeg newspaper columnist called a couple of local restaurants (two to be precise), and defended Kane from the nasty implications, but what all this suggests is that somehow, some way, in a small prairie city that actually worships its professional hockey players, one of those players has angered enough people to become much less than worshipped. … for a kid who wanted a trade early in the season, has responded with improved play to two benchings and has been the most explosive offensive force on a team that can't score, this just might be another wake-up call. Because when you've pissed off a fan base that wants to love you as much as their own family members, you're probably doing something wrong. Lawless writes that he's been critical of Kane in the past; as it was here, the criticism has often been constructive. But Lawless's primary advice is to the fans in treating the Jets: "They shouldn't be handled any differently than anyone else. They shouldn't be lied about and they shouldn't have to face irresponsible attacks on their character." Even if those players are Ray Charles to the [expletive].